At first glance, the indigenous Bolivian women don't look much like mountain climbers, with their colorful, multilayered skirts and fringed shawls. 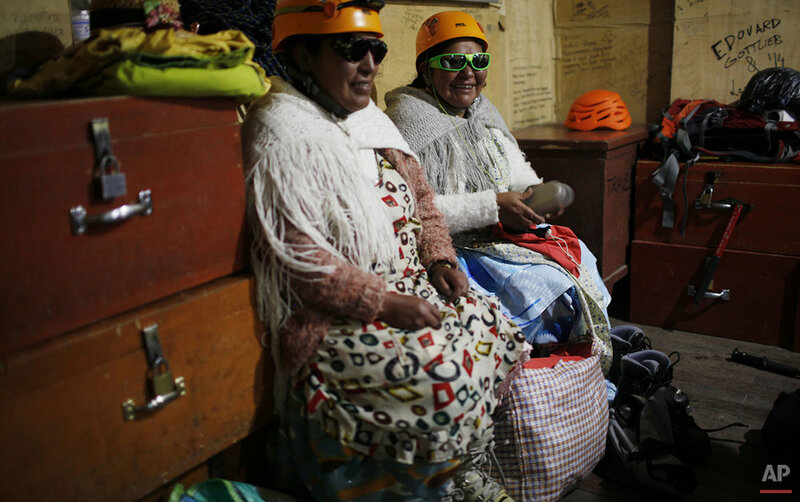 But their helmets, polarized goggles and crampons attached to their shoes give them away as mountaineers who accompany their husbands, often as cooks and porters, as they guide tourists scaling the local peaks. 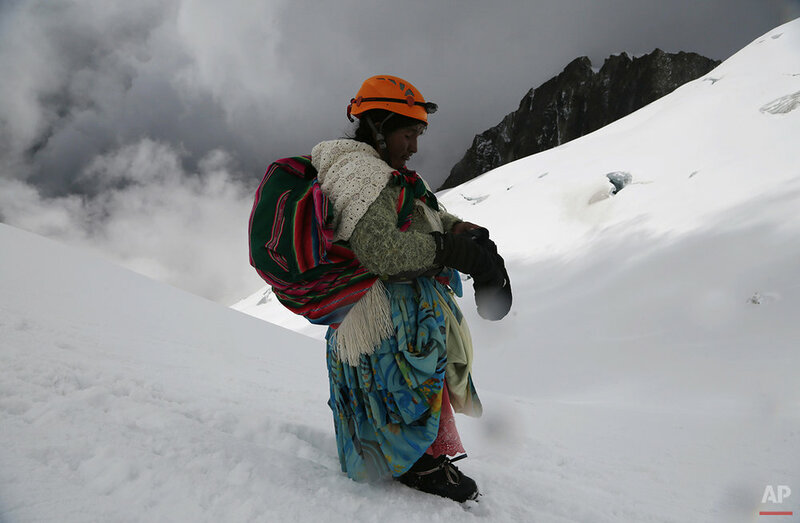 Eleven of these Aymara women, ranging in age from 20 to 50 years old, earlier this month made the two-day climb up the 19,974-foot (6,099-meter) high Huayna Potosi, located near La Paz, with Lake Titicaca to the back and surrounded by snowy Andean peaks. They started their climbing careers working for tourist agencies, carrying food and other equipment for the foreign mountaineers to the base camp, located at 1,116 feet (5,130 meters). "First, I was a porter, then a cook," said 41-year-old Domitila Alana Llusco. 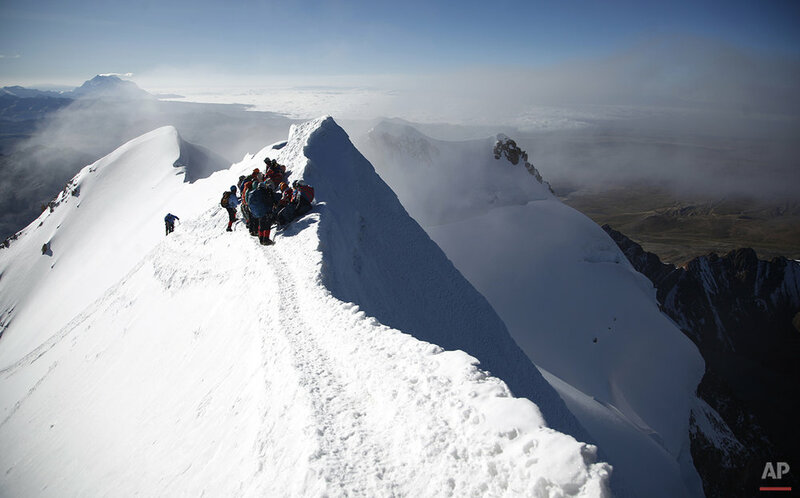 "But the tourists asked me what it was like up on Huayna Potosi and I had to climb up so I could find out and tell them." Alana said she had a hard time finding appropriate gear she could afford when she started 15 years ago. "My feet are small, there are no boots," she said. "But nothing stopped me and I have reached the peak of three mountains." 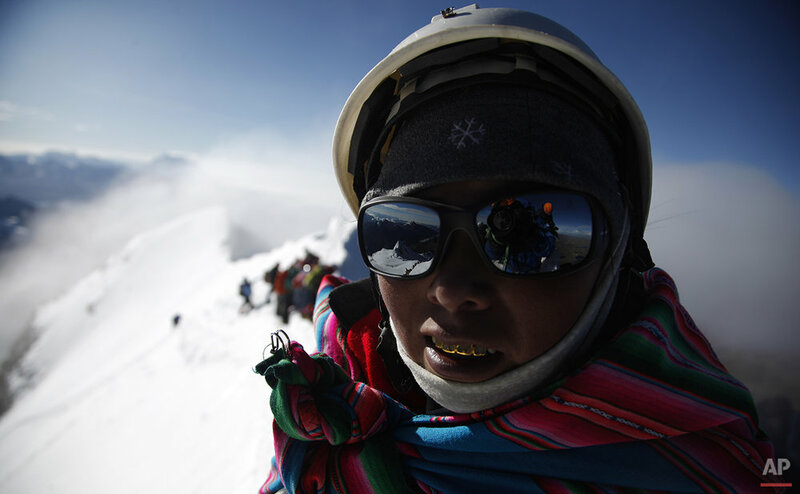 Though they cling to their traditional clothing, these mountaineers aren't typical indigenous women. 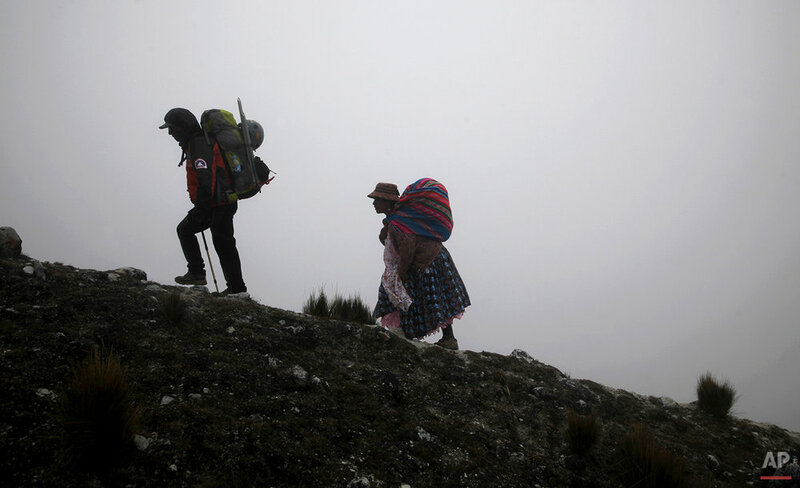 "Women also have the right to climb mountains," said Adrian Quispe, one of the mountain guides. "It's not just men who are allowed. Women of all ages can go." And the money is good. While the minimum wage for a housekeeper is around $175 a month, guides can earn $35 a day and the female cooks about $20 a day. 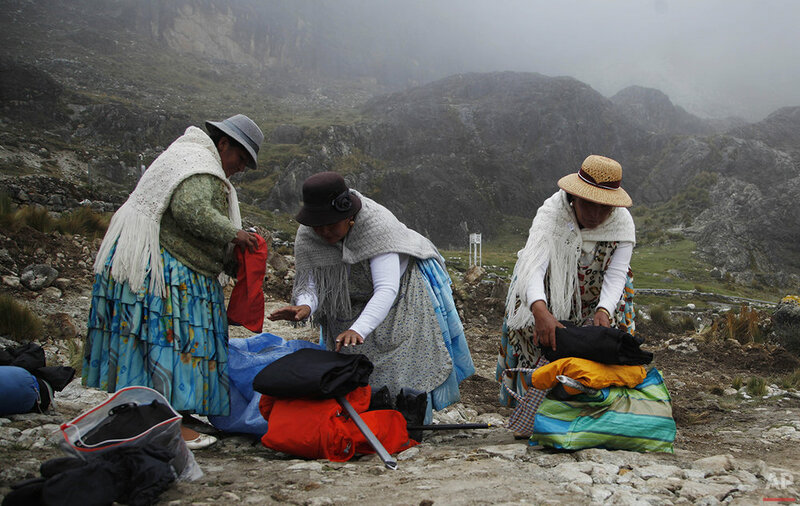 As they climb, the women wear thermal sweat suits under their traditional clothing. Only in the last part of the climb up to the top do the women remove their skirts, to prevent accidents. They start the last piece of their ascent after midnight to take advantage of the hardness of the snow, hoping to reach the top by dawn. Some of the youngest in the group now dream of climbing even higher someday, to the top of Aconcagua, which at 22,834 feet (6,960 meters) is not only the highest peak in the Andes, but also the highest mountain outside Asia. 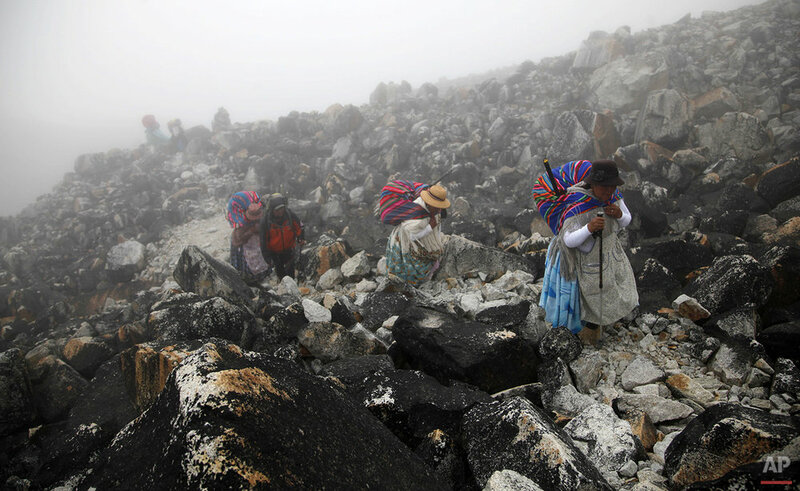 Text from the AP news story, Indigenous Bolivian women scale mountains outside La Paz.